As is written in the composition agenda, before jumping right into the pastiche itself I've done a close analysis of the piece. I think Beal does a fantastic job at evoking the period (1930s "dustbowl" era) and at instilling a sense of wonder and magic, which is perfect for the series. From what I can discern, the instrumentation includes at least various percussion such as hand drums, a string section, banjo, piano, a warbly male voice, and what sounds like a wind instrument. I'm not sure what to call the mode or scale the piece is in, other than Major Minor; there's a major third with a minor sixth (and eventually a tritone, possibly implying a Lydian feeling). I'm leaning towards using the inverted contour, with an adjusted rhythmic pattern. 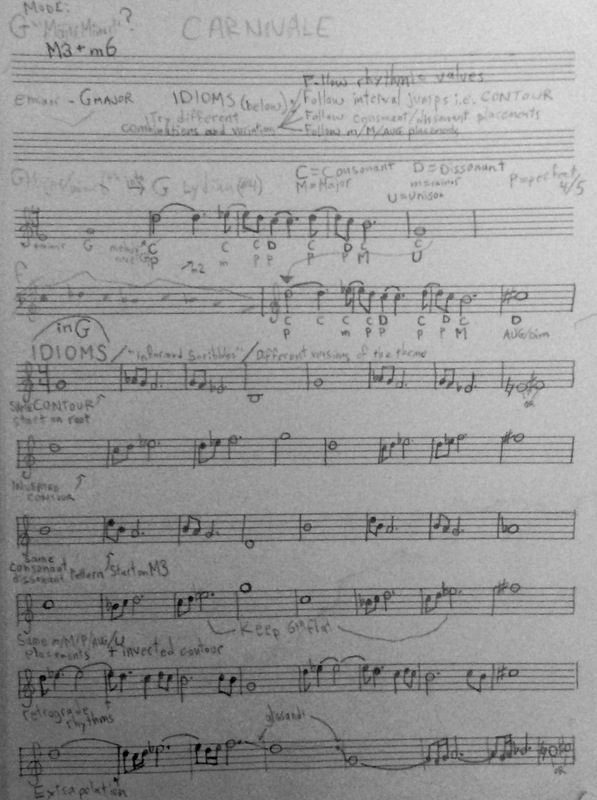 This pastiche marks the inaugural task in my composition agenda, it will be finished by October's end!